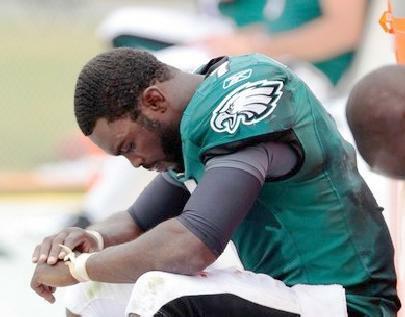 *Eagles quarterback Michael Vick was scheduled for an autograph signing at Buffalo Wild Wings in York, Pa but the event was cancelled after the owner received death threats. According to Joe Bartolo, the owner, the signing was postponed after several death threats were made against him, his wife Jamie, the owners of JJ Cards N Toys and their family for putting together Vick’s appearance in October at a local Buffalo Wild Wings restaurant, according to Local21News.com. Apparently those who made the threats were furious with Bartolo for bringing Vick to the area. As you may recall, Vick served an 19 month sentence for running an illegal dog fighting ring. Bartolo reported that the threats were coming in from various parts of the country and was forced to shut down the store’s Facebook page. Vick had to cancel two other public appearances in the past due to death threats including his booking in Atlanta and Philadelphia back in March. Enough is Enough》dog fighting compared to killing people. Which is worse-hmmm?!?! He doesnt owe any more explanation to anyone + he had to do time. My problem with the public’s reaction is their equating a dog’s life to a human’s. Yeah, it’s horrible to have an animal suffer and die for entertainment, but should someone’s life be taken in retribution? Once again, it is an animal, plain and simple, and considered property by the law. Death Threats??? Really??? what Michael did was cruel and vicious but he paid for his crime and unlike Chris Brown, Michael has not been in any furhter trouble, no angry tweets, no public outbursts and he has not been to court every month for probation violation, he dealt with his punishmanet like a man, no whining either. It’s one of those days again! I agree with you 1 hunna percent babycakes. @ Testic!! you know I am right! LOL!! Glad you agree! !